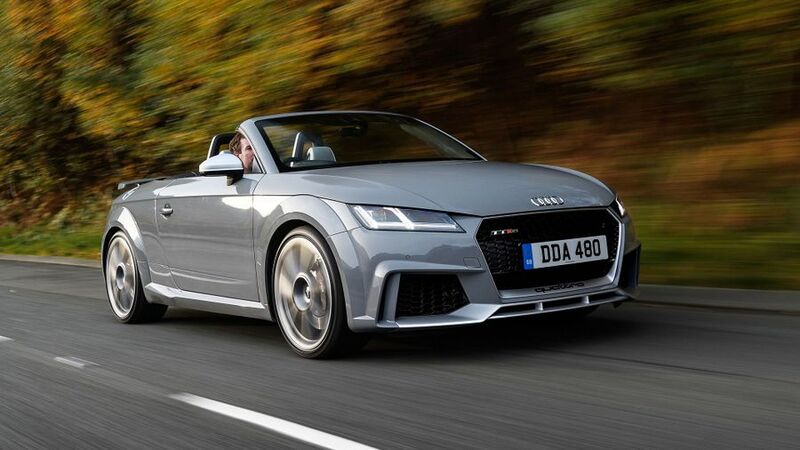 The RS Roadster sits loud and proud at the top of the Audi TT range, providing ballistic performance, a bombastic exhaust note and wind-in-the hair thrills. However, you’d best look elsewhere if you’re the shy, retiring type. When it comes to looking and sounding great, the TT RS Roadster is right on the money. Edgy, sun-seeker looks, a pair of booming exhausts and a beautifully crafted interior are guaranteed to attract gob-smacked gawps, even from the most cynical bystander. It’s not ‘all mouth and no trousers’, either, as its monstrously powerful five-cylinder turbocharged engine delivers a devastating turn of speed. Trouble is, it’s actually too powerful for its own good. With softly tuned suspension intended to minimise the dreaded body shakes, you’ll quickly arrive at a point when the chassis simply can’t cope with the levels of performance on offer. Porsche Boxster, anyone? Interested in buying an Audi TT RS? You buy an roadster car because you enjoy the thrill and freedom of blustery open-top motoring, right? Well, that’s one reason, but as we all know, roadsters are as much about grabbing the headlines as blasting down a country lane with the wind tousling your locks. Well, that’s pretty much a given with the RS Roadster. 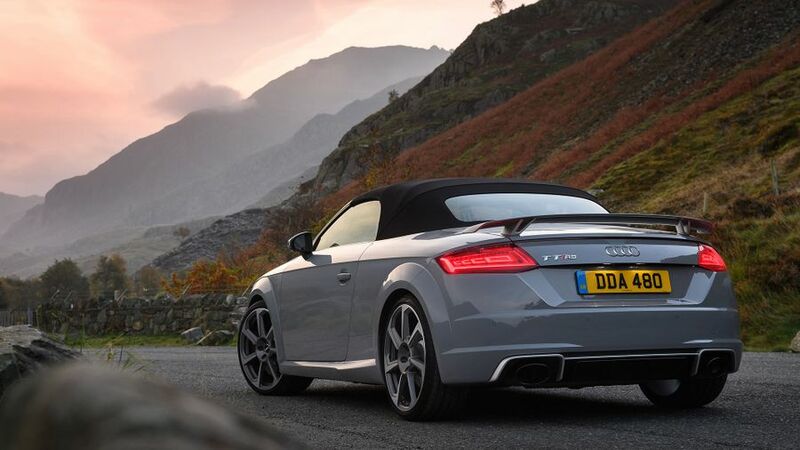 The most obvious details that set it apart from other TT Roadsters include a fixed wing on the boot lid, a deeper front spoiler with ‘Quattro’ lettering on it, and jumbo-sized alloy wheels that fill those blistered wheelarches a proper treat. 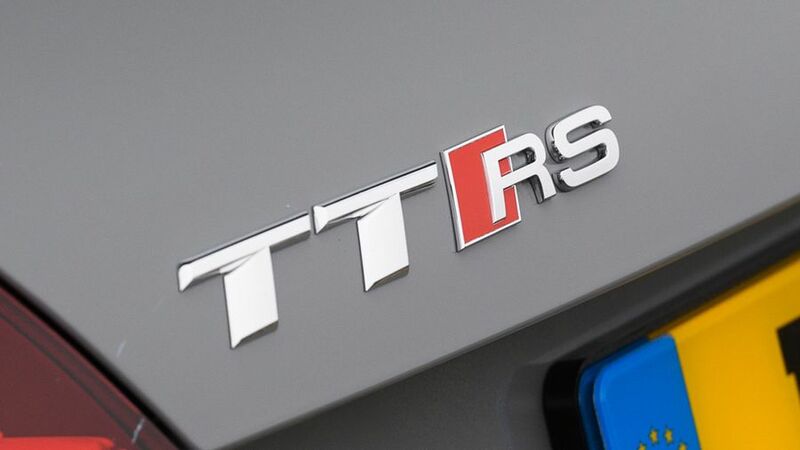 Together with a thunderous exhaust note, roof up or roof down, the TT RS is guaranteed to get you noticed. The driving position in the RS is excellent, thanks to a wide range of seat and steering wheel adjustments; but, because the TT is based on a hatchback platform (the VW Golf’s), you sit higher than you would in a bespoke sports car like the Porsche Boxster. The cabin also has a very high-tech feel, with digital air-con dials built into the vents, a set of heavily-bolstered, figure-hugging, heated leather sports seats, and soft Alcantara trim on the steering wheel and gear selector. As with all TTs, cabin quality is peerless, with stylish, expensive-looking materials used throughout. 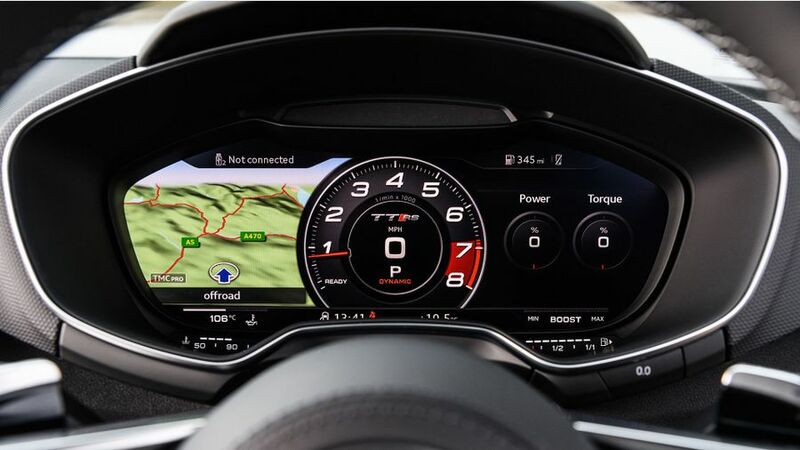 The RS also comes with Audi’s ‘Virtual Cockpit’ – which means all the main menus are displayed in one massive 12.3-inch screen that takes the place of the conventional dials. It’s certainly a ‘wow’ feature, but unlike in several other Audi cars, which give you an additional screen to help share out all the various menus, every piece of detail is jammed into the RS’s central binnacle. It can all be accessed via buttons on the steering wheel, voice command or the MMI dial on the centre console, but it’ll take you quite a while to familiarise yourself with how it all works. Roof-up, the RS Roadster is almost as quiet as the Coupe and, roof-down, you can saunter along at motorway speeds relatively bluster-free, with the side windows up and the electrically operated, transparent wind diffuser in place. The roof itself can be lowered or raised in around 10 seconds at speeds of up to 31mph – handy if you suddenly get caught out by a drop of liquid sunshine. The roof stows neatly into the narrow space where the rear seats would be in a Coupe, which means you get a respectable 280 litres of boot space, whether the roof is up or down. That’s enough for a couple of medium-sized suitcases, although the opening itself is quite narrow. That said, space and access are so much better than in rivals which employ folding steel roofs, such as the BMW Z4 and the Mercedes SLC. The RS also has quite a decent glovebox, reasonably accommodating door pockets, and a few smallish cubbies, including one under the centre armrest for storing loose items. Nearly every roadster sacrifices some sharpness in the way it handles to try and control the body shake that can often affect an open-top car. Most are fitted with softer suspension than the coupes they are often based on; and, while this is not a problem with lower-powered versions, controlling something with the performance of the RS is much more problematic. Admittedly, if you just use it to go to the shops or motor to the other end of the country by motorway, you’ll be pretty happy with the comfort it provides. However, if you open the taps down a twisting B-road, you’ll quickly find yourself backing off the power as you’re jostled around and, in some extreme cases, become completely detached from your seat, as the suspension struggles to prevent the body from rising and falling like a manic fairground ride. It’s even more frustrating when you know that the trick four-wheel drive system and wide, sticky tyres mean the RS has an enormous amount of grip. Drive it hard into a fast, smoothly surfaced corner – the emphasis here being ‘smooth’ – and it’ll stay flat and composed, and slingshot you out the other side at simply crazy speeds. Without question, it’s the RS’s 2.5-litre, five-cylinder turbocharged engine that really sets it apart from the rest of TT range. By shovelling 395bhp into a car this light and compact, Audi has effectively given the TT supercar-like levels of acceleration. That’s even more amazing when you consider the TT costs around a third of what your average supercars will set you back. Hooked up to the Quattro four wheel-drive system, the RS gets off the mark with nothing less than obscene haste; and, while the mid-range pull is simply astonishing, the way the engine builds revs and remains so smooth throughout the rev range makes it one of the truly great modern engines. Eat your heart out, Porsche 718 Boxster owners. It sounds simply awesome, too, and is especially bombastic when coupled to the optional sports exhaust that emits a raucous and hard-edged bark with every down change of the seven-speed dual-clutch gearbox. Unfortunately, for all you purists out there, there’s no manual-gearbox option. You don’t need the deductive powers of Inspector Poirot to work out that the TT RS is going to cost a lot more to run than any other version of Audi’s stylish roadster. Servicing, brakes, tyres and so on will all cost you more than in the less racy variants, but it’s not as bad as you might think. Well at least not on paper, anyway. Considering the potent engine, official average economy of 34.0mpg and CO2 emissions of 189g/km are pretty encouraging, but those figures are calculated in a lab. Use the RS as intended, however, and you’ll devour super unleaded at a truly ferocious rate. As for servicing, we may not be talking Porsche rates, but parts and labour won’t be cheap. As for insurance, the RS is in the highest group available, and unless you’re a Dotcom millionaire, younger drivers may as well keep on dreaming. Despite the company’s cars seeming to have excellent quality, Audi’s reputation isn’t an enviable one, according to Warranty Direct’s Reliability Index. The brand languishes near the bottom of the manufacturer standings, and the previous TT wasn’t one of the company’s better performers, either. The RS sells in much smaller numbers than the standard car, but bar the beefed-up mechanicals, many of the parts are shared, so there shouldn’t be any nasty surprises. Service intervals are annual, and the RS has the same three-year/60,000-mile warranty as the standard TT. Apart from the addition of Lane Assist, which helps steer the car back on course if you start to wander out of lane, the RS comes with the same safety kit as every other TT, including traction- and stability control, as well as four airbags. It’s not a particularly impressive specification, but it’s pretty much par for the course in this class. In Euro NCAP crash tests, the TT Coupe received what looks like a rather disappointing four-star rating, but that’s partly because it was tested under new, tougher regulations, and partly because Audi does not offer automatic emergency braking on the TT. Even so, it did do well for both adult and pedestrian protection, scoring 81% and 82%, respectively. The Roadster also comes with roll-over bars behind the seats, which should help protect occupants in the event of the car ending up on its roof. The standard kit list is like the safety roster: generous in some areas, but with some key omissions that you would expect to be there, considering the car’s price. Climate control, LED headlights, heated leather seats, sat-nav, Bluetooth, a decent sound system, plus the sportier styling elements, are all included. Things you might want to add from the extensive options list include – but are not limited to – carbon fibre dash inserts (you can also get a rather cool, if slightly pointless, carbon engine cover), a sports exhaust, electrically adjustable seats, and a high-end Bang & Olufsen stereo. The option packs look like better value, as they bundle several bits of key equipment together. The Comfort and Sound pack adds the aforementioned hi-fi, electric memory seats, dimming door mirrors, and an advanced key fob. The Dynamic pack, meanwhile, adds the bellowing Sports exhaust, and in our opinion, it should be the first box you tick. 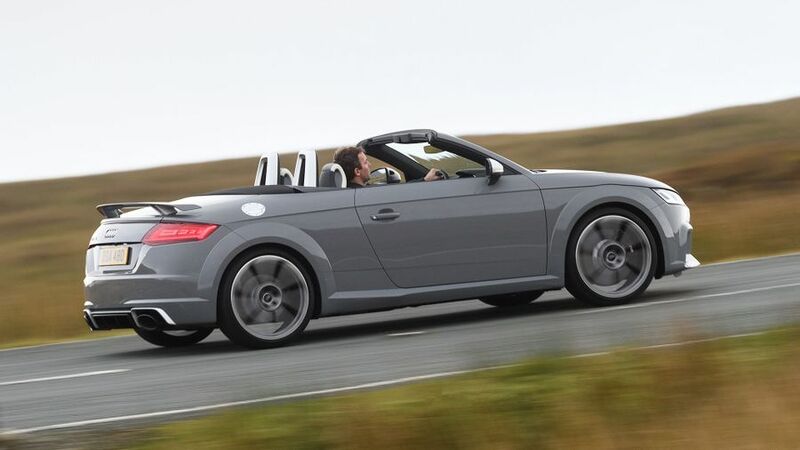 There’s a lot to love about the TT RS Roadster, like its classy looks and cabin, along with the awesome performance and simply bonkers noise it makes; and, anyone who buys one will be entering a very exclusive club. But, the trouble is that you do have to make some sacrifice, as the RS simply isn’t an engaging driver’s car. It may have power to burn, but its chassis struggles to cope with UK roads, and to such an extent that, despite its lesser performance on paper, a Porsche Boxster would simply leave it for dead on any country road.